Ntshondwe rolls across the slopes of the Ngotshe Mountains in Ithala Game Reserve. Ntshondwe Camp is located in the Ithala Game Reserve in northern KwaZulu-Natal. The reserve stretches from the Ngotshe Mountains into a deep valley, carved by the Pongola River over millions of years. Ithala's topography extends over lowveld as well as riverine valleys and high-lying grassland plateaus with cliffs and ridges, ensuring a diverse safari experience. The reserve is home to an abundance of different species. Especially notable is the very high number of giraffe which grace Ithala. 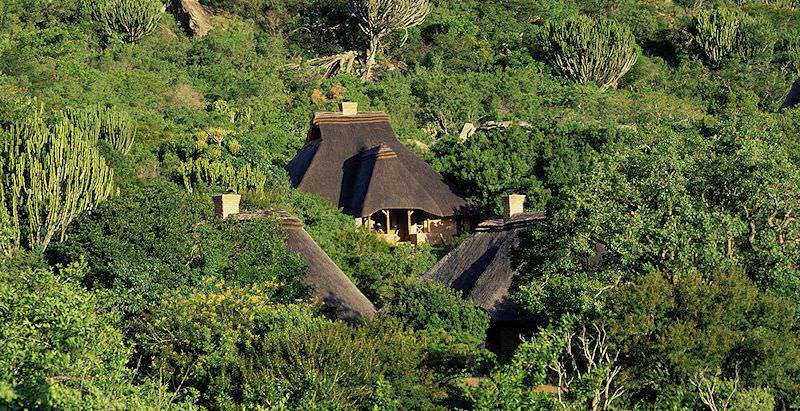 Ntshondwe Camp consists of 39 thatched chalets. The chalets are surrounded by a lush growth of indigenous flora. Each chalet is tastefully decorated and equipped with an en suite bathroom. The chalets are situated around the main lodge. The main lodge has a restaurant where quality meals are served, a bar and a game-viewing deck which looks out onto a small pan. The camp's swimming pool is built around a giant rock at the foot of a hillside. A small shop offers locally-made arts and crafts as well as the most basic of necessities. There are various picnic sites on the reserve that are equipped with braai areas and toilets. These are ideal places to enjoy a late breakfast or lunch. Ithala, though not as well known as some of the other reserves found in the country, offers an incredible South African safari experience. In my opinion, Ntshondwe is the finest of all the national park camps in South Africa. Ithala is not one of the most well-known of South Africa&apos;s safari areas. It is, however, a great national park to visit. The varied terrain creates an abundance of ecosystems inhabited by a large number of different mammals. You will have a most comfortable stay at Ntshondwe, with well-appointed en suite rooms and a setting that is truly impressive. The game drives are sure to be enjoyable and the quality of meals served in the local restaurant is very good. South Africa is Africa's most diverse travel and vacation destination. Namibia's safari areas range from arid Sossusvlei to wildlife-rich Etosha. Zambia is a safari lover's paradise, with remote and authentically wild parks. Travel to Zimbabwe for a memorable glimpse of the Victoria Falls. Mozambique is known for pristine archipelagos like Quirimbas and Bazaruto. The Kruger National Park is a bucket list safari destination, with unparalleled diversity and rewarding game viewing. The Sabi Sand Private Game Reserve is home to world-class lodges like those in the Singita and Londolozi collections. As a travel destination, Cape Town couples a cosmopolitan atmosphere with breathtaking natural scenery. The Garden Route is both an exciting family vacation destination as well as romantic escape for honeymoon couples.